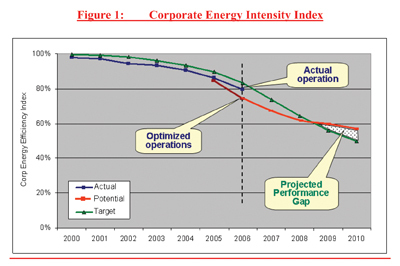 Part One of this article (in the November 2008 issue) discussed the numerous benefits of energy optimization, particularly as they applied to a major oil company. Part One discussed retrofitting old plants and building new plants in ways that optimize energy use; Part Two discusses other issues the company addressed in building a corporate culture of energy optimization. Building a Supportive Organizational Infrastructure. These activities generally fall into the categories of awareness, training, knowledge management, and standards/procedures. Annual, company-wide “energy-awareness” events, including technical exchange of successes and failures, vendor exhibits, etc. When the idea of energy Key Performance Indicators (KPIs) was initially broached within the company, it found no audience, since it was not common international practice during the early years of the program. In fact, when the energy team surveyed the industry, it uncovered not a single company that had developed such KPIs, even among the so-called management gurus. The situation changed suddenly and dramatically. Almost overnight it seemed that all the top international management consulting firms began to extol the virtues of company-wide KPIs for a wide range of critical corporate performance metrics to be listed on the company “dashboard.” One of them—McKinsey & Co.—was retained by senior management in 2005 to develop such a dashboard. This gave the Energy Systems Unit (ESU) an ally with the clout to include an internally developed, company-wide Energy Efficiency Index on the new dashboard. Although the ESU’s original formulation was ultimately used in a considerably simplified form by the consultant (drill-down capability to process unit and equipment levels was sacrificed), it put everyone in the middle echelons of company management on notice that the energy efficiency of their business units would be monitored from that point forward. Despite their clear potential to introduce transparency and accountability, KPIs in general can be problematic to implement in practice. The mathematical formulation of KPIs must keep in mind the ultimate objective(s). In this case, there were multiple applications. One was to keep tabs on overall plant and corporate energy intensity, to monitor progress toward the Energy Management Steering Committee (EMSC) goal. Another was to make dispatching decisions—e.g., what should the product mix be at each manufacturing plant? A third was to provide a diagnostic tool to help plant engineers troubleshoot problems and identify areas for improvement—regarding both process and equipment efficiency. One example of a process problem might be steady deterioration in the inlet temperature to a crude oil distillation column, which would suggest gradual heat exchanger (HX) fouling in the preheat train and the need for cleaning. If, on the other hand, there was a sudden drop, it might suggest an HX tube rupture. Each application requires a different formulation for the energy KPI, called Energy Performance Indexes (EPIs for short). These were classified into four categories: product EPIs for dispatching (to be used by the planning staff), equipment EPIs for condition monitoring and maintenance management (to be used by the operators and engineers), process EPIs for troubleshooting (to be used by plant engineers), and overall plant EPIs for reporting (for use by management). While process and equipment EPIs are relatively easy to formulate, product EPIs are not. For example, how should the energy cost of a distillation column that is separating two saleable products be allocated between them? The intuitive way is to prorate on the basis of either value or volume, but both can lead to clearly absurd decisions. The only logically consistent approach that gave sensible answers was to do the allocation on a value-added basis. This created a new problem: computing transfer prices for each stream within a process unit. After several months of trial and error, the team managed to develop a procedure that consistently gave meaningful results. Formulating an overall corporate energy intensity index also proved to be a challenge, as the goal was to measure the effectiveness of the energy program itself—i.e., how much difference did it make compared to doing business as usual? This was, in fact, the single metric initially proposed to management (with the management consultant’s approval) for use on the corporate dashboard, and it is shown in Figure 1. It ended up not being accepted, as the formulation is very complex and was not easy to understand by the average manager. The consultant therefore was directed to develop a considerably simplified formulation that was similar in structure to the indices published by many other international oil and petrochemical companies and was more suitable for the benchmarking objective the Executive Committee had in mind. Data availability and quality turned out to be two other difficult issues. When Engineering, Procurement, and Construction (EPC) contractors design plants, they do not include instrumentation to measure all the parameters needed to compute such EPIs. Thus, there is a need for considerable additional instrumentation, such as temperature and pressure gages (which are relatively cheap) and flow meters (which are not). Then there is the cost of programming all the equations and testing the system for bugs, adding graphing/display capability, and designing report formats for printing. That was the easy part. The real difficulty lay in reconciling discrepancies in the mass and energy balances. For that, the team turned to a small high-tech Belgian software company they considered the world leader in data reconciliation techniques. Two field trials lasting nearly 2 years overall were conducted—one at an oil refinery and one at a gas processing plant—which made clear that it took a very high level of technical skill to get reliable results and that long-term technical support from the vendor would be required before the engineers would be sufficiently trained to take over. The original proposal was to purchase a 20-plant license of the software, but given the inability to use it effectively and the vendor’s lack of adequate resources to provide long-term technical support, the project was put on hold until a satisfactory solution could be found. Despite these difficulties, the foregoing problems are not intractable and can be solved given enough time, talent, and budget. The most difficult problem turned out to be non-technical: getting agreement from all facility managers on a set of common metrics and a common graphical user interface. Companies should expect to encounter various delaying tactics by powerful interests who may feel threatened by increased transparency. The principal hurdle, in short, is likely to be political, to which there is no easy solution. Building the right level of in-house technical expertise and management capability is the final strategic decision. It is not necessary to do all the work in house, but it is absolutely essential that the energy team have sufficient experience to effectively outsource the work. For companies that do not have sufficiently high energy bills to justify maintaining a fully staffed energy unit, one option might be to appoint a single full-time energy “guru,” reporting up to a Vice President (VP) at least, and then retain a trusted energy management consultant to help select and supervise other consultants, EPC contractors, and energy service companies (ESCOs). These are not easy things to accomplish in an organization that has more than 50,000 full-time direct employees and over 100,000 contractors working on company premises at any given time. But they have to be done. As an example, the second bullet item in the list above has internal organizational implications that have to be cleared with the law and human resources departments. In addition, there are difficult technical issues with respect to measurement and verification of savings, legal issues with respect to dispute resolution with the ESCO, and insurance/visa/security issues if the ESCO is a foreign company whose employees must be given access to company plant sites. Similarly, the fourth bullet item requires breaking down long-established boundaries between rival organizations that may have had an unfortunate prior history of internal power struggles and mutual suspicion. Fortunately, much progress has been made in this arena. The concepts of capital cost offsets, environmental credits, and risk-adjusted hurdle rates are being considered for incorporation into the project evaluation procedure. The technical career path is being made more attractive to retain top engineering talent by providing a viable alternative to the management track. It may sound daunting, but it is well worth doing. Kumana, J.D. and Ali H. Al-Qahtani. “Optimization of Process Topology Using Pinch Analysis.” Proceedings of First International Symposium on Exergy, Energy and Environment, Izmir, Turkey (July 13?17, 2003). Edited version republished in Saudi Aramco Journal of Technology (Winter 2004): 13?23. Kumana, J.D. and Majid M. Al-Gwaiz. “Pricing Steam and Power from Cogeneration Systems using a Rational Allocation Procedure.” Proceedings of 26th Industrial Energy Technology Conference, Houston, Texas (April 2004). Kumana, J.D. and Ahmed S. Aseeri. “Electrical Power Savings in Pump and Compressor Networks via Load Management.” Proceedings of 27th Industrial Energy Technology Conference, New Orleans, Louisiana (May 2005). Edited version republished in Saudi Aramco Journal of Technology (Fall 2005): 39-43. Kumana, J.D. and Khalid D. Al-Usail. “Energy Performance Indices as a Process Diagnostic Tool.” Presentation at Saudi Aramco’s Process Performance Monitoring and Data Analysis Symposium, Manama, Bahrain (Nov 7?8, 2006). Kumana, J.D., Ali H. Al-Qahtani, and Abdullah Y. Al-Juhani. “Energy Optimization Experience at Yanbu Refinery,” paper 655a. Presented at American Institute of Chemical Engineers Annual Meeting, San Francisco, California (Nov 12?17, 2006). Kumana, J.D., Ali H. Al-Qahtani, and Faiz H. Al-Farsi. “Power Savings via Load Management at Rabigh Refinery.” Presented at 2nd Saudi Arabian Energy Conservation Forum, Dammam, Saudi Arabia (Nov 28?29, 2006). Polley, G.T. and J. D. Kumana. “Energy Saving Retrofit of an FCC Plant,” paper AM-07-30. Presented at National Petrochemical and Refiners Association annual meeting, San Antonio, Texas (Mar 18?20, 2007). Kumana, J.D., “Success Factors for a Corporate Energy Program.” Presented at 29th Industrial Energy Technology Conference, New Orleans, Louisiana (May 9?10, 2007).